Users of the social network have shared their views on news that Twitter has implemented a system to withhold tweets on a country-by-country basis. This article was published on guardian.co.uk at 07.19 EST on Friday 27 January 2012. It was last modified at 07.20 EST on Friday 27 January 2012. The social network Twitter is facing a storm of criticism from users, after revealing that it has implemented a system that would let it withhold particular tweets from specific countries. The company has insisted that it will not use the gagging system in a blanket fashion, but would apply it on a case-by-case basis, as already happens when governments or organisations complain about individual tweets. 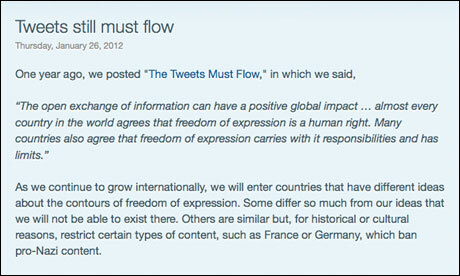 The new system, which can filter tweets on a country-by-country basis and has already been incorporated into the site’s output, will not change Twitter’s approach to freedom of expression, sources there indicated. In theory it could have been used last year in the UK to block tweets exposing details hidden by superinjunctions about celebrities, or in 2010 when Trafigura used a superinjunction to block the Guardian and BBC from revealing details about a report on activities in Africa.